Wilson Hartnell (WH) is the largest and one of the longest established communications agencies in Ireland, with a proud reputation of delivering best in class work time after time. Our depth of communications’ expertise and experience has remained a constant while in recent years WH has fully embraced and led the evolution of Ireland’s rapidly-changing marketing sector. We continue to attract talented, enthusiastic and committed people who embody our ethos; people who create, who innovate and who always take the time to deliver insight-led communications’ strategies for our clients. We represent a wide spectrum of Irish and international companies and brands that have an impact on every aspect of our lives. WH is part of the Ogilvy family, and drawing on its creative heritage and international network we also manage global communications programmes for clients from the heart of Dublin city. Sharon is the Chief Executive of Wilson Hartnell. She has been with the company for nineteen years and prior to this role, she ran the Consumer Practice for 12 years. Sharon is former Chairman of the Public Relations Consultants Association (PRCA 2015 – 2017) and a former Board member of the International Communications Consultants Organisation (2015-2017). Sharon has extensive experience across multiple sectors including FMCG, utilities, banking, telecommunications, insurance and retail. She has also worked on many public information campaigns for semi-state bodies. Sharon team is a multi-award winning team having won several high profile awards over years including two Supreme awards from the Public Relations Consultants Association. As social scientist, Sharon is passionate about innovation within the industry and has embedded digital competencies as an integral approach to PR. A native of Cork, Sharon grew up with a family retail business and from a very young age, was involved in many aspects of it. She was educated at University College Dublin, where she obtained a BA (Hons) in Social Science, specialising in social research. She holds an MA (Hons) in Public Relations the Dublin Institute of Technology; a Diploma (Merit) in Strategic Management from the University of Cambridge and a Certificate in Social Media from the Public Relations Institute of Ireland. Roddy Guiney is Chairman of Wilson Hartnell PR. He has spent most of his career with WH joining the board in 1978. He went on to become Managing Director in 2003, overseeing a period of remarkable growth for the consultancy. A specialist in corporate public relations and sponsorships he has been involved in the creation and development of many major sponsorship and CSR partnerships, particularly in the sports area where he put together Irish Life’s CSR involvement with the GAA’s Healthy Club initiative. He has also devised award winning sponsorships across a number of sports. He is heavily involved in Irish sport being the current chairman of the Federation of Irish Sport, the umbrella body for all of the national governing bodies in Irish sport. Brian Bell is chairman of Ogilvy & Mather Group Ireland. Until recently he was Chief Executive of Wilson Hartnell. His specialisation is financial and corporate communications and media relations. Brian has wide experience in dealing with business, personal finance and news journalists. He has worked on numerous public flotations, acquisitions, MBOs and take privates, on behalf of the Quinn Group, Smurfit Kappa, Fyffes, DCC and Total Produce. His clients included: DCC, Fyffes, Smurfit Kappa Group, and Irish Life. Brian also worked with Canada Life/Great-West Lifeco on the acquisition of Irish Life. Prior to joining the firm in 1989, Brian spent ten years as a business journalist with the Irish Press Group of national newspapers, where he was financial editor. He was also a regular contributor to RTE, the BBC in London and Belfast and the ‘Independent’ and ‘Daily Mail’ newspapers in London. The holder of a diploma in journalism from the College of Commerce, Rathmines, Dublin, he has also completed the Irish Management Institute’s Directors’ and Senior Managers’ Programme and is a member of the Institute of Directors in Ireland. Jennifer is the Head of the Corporate and Public Affairs team in Wilson Hartnell. She has extensive strategic communications and issue and crisis management experience having worked in national politics for over ten years. Jennifer has a detailed understanding of the political and policy landscape and processes. She has been a senior special adviser in four Government departments, including Justice and Equality, Children and Youth Affairs, Health and Children and, most recently, Housing, Planning and Local Government. She was also a former Legal Adviser to Enda Kenny when he was leader of the Fine Gael party. Jennifer has lectured extensively on Irish politics, public policy, legislative development, crisis management, communications and advising Government ministers. She is the author of a legal and political academic text, “The Politics of Judicial Selection in Ireland” as well as several publications on political institutions in Ireland and the constitutional separation of powers. She is the 2015 winner of the Basil Chubb Prize by the Political Science Association of Ireland for the best politics PhD in Ireland and a former Government of Ireland Scholar. WH’s Corporate & Public Affairs Practice focuses on communications and reputation management for a broad cross-section of clients from financial; insurance; aviation; manufacturing; retail; professional services; technology; energy and telecommunications sectors. A large amount of our work deals with integrated stakeholder communications, particularly in the area of change management. We work with both Irish based and global public limited companies, providing financial PR services and advice, with the objective of building confidence amongst shareholders and the wider investment community. Our experience in this area includes results announcements; annual general meetings; annual reports; mergers and acquisitions; flotations and other key company developments. Crisis PR and issue management has become a growing part of the corporate work in recent years and here our experience includes developing and implementing communications strategies for companies faced with the need to implement restructuring programmes; announce job losses or close manufacturing facilities. Across all clients, WH’s deep understanding of the media landscape delivers strong results in terms of positive profile building for companies and senior executives. 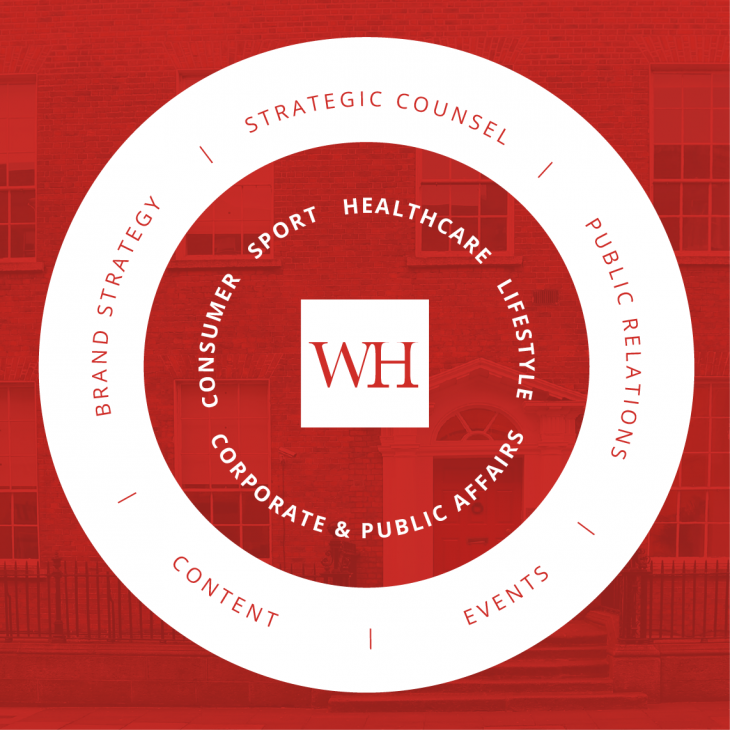 After four decades of handling media relations for leading Irish and international companies, WH has strong contacts across the board in the print, broadcast, online and social media. Our team has wide ranging experience in media relations and has the expertise to work across print, television, broadcast and social media. Our services include managing media relations, press monitoring and media strategy for both traditional and social media. WH Public Affairs experts have knowledge and understanding of the local, regional and national political landscape in Ireland. We also possess deep experience of the political process in Ireland, Europe and the United States, providing a rich understanding of how decisions are made by political stakeholders of all kinds. We are expert in carrying out research and drafting reports which provide thought leadership and unique insights. Our findings are used to highlight key issues facing an organisation or industry with an approach that combines policy analysis with best practice tools and insights from public relations, management consulting and political campaigning. Our Public Affairs experts are adept at organising events to act as major profile boosters for our clients and any issues or concerns they wish highlight to consumers, industry or stakeholders. The team has run nationwide competitions, press conferences, seminars and awareness raising campaigns for large multinationals, Non-Governmental Organisations and major international institutions. Lorraine Dwyer joined WH in 2005 and set up the Lifestyle Practice. Her team specialises in planning creative and strategic communications programmes for a range of retail, fashion, foodie, home, beauty and travel brands including Marks & Spencer, Kildare Village, AVOCA, Specsavers, PANDORA, Milano, Saba, Smirnoff, Haagen-Dazs, Siúcra, WELLA, Brittany Ferries and TUI Travel. Lorraine is passionate about social media and works closely with her colleagues in the in-house Content Hub. Lorraine, who began her career with Irish Distillers, has worked in the PR business for over twenty years. She joined WH from O’Herlihy Communications where she worked across a range of Consumer/Corporate clients for four years. She spent a year in Sydney, where she was involved in a series of major events around the Millennium Celebrations and 2000 Olympic Games. She previously worked with Fleishman Hillard in Dublin. A graduate of University College Dublin, she hold an honours PR diploma and a certificate in Social Media from the Public Relations Institute of Ireland. Lorraine sits on the board of Wilson Hartnell and is a member of the PRII, MII and WXN. Lifestyle is a boutique division, which creatively promotes and enhances high profile brands. Our clients encompass brands from a range of lifestyle, luxury and high street industries – retail, fashion, foodie, home, beauty and travel. We are a dynamic team offering a unique combination of talent, creativity, knowledge and strong bonds with influencers across the island of Ireland including; editors, journalists, bloggers, vloggers, stylists and photographers. Our Lifestyle team underpin all communication strategies with digital and work collaboratively with brands. We are passionate about who we represent and pride ourselves on being an extension of brand teams. Our campaigns to date have proven successful in establishing, promoting and distinguishing brands and personalities in a crowded environment. We have full access to international trends and research through the Ogilvy PR network. By tapping into international best practice and new communications tools, Lifestyle can create plans that engage our clients directly with key audiences. Our offices, situated in two adjoining Georgian Houses, incorporate showrooms, a stunning outdoor courtyard and have been the location for many launches and Press Days. A native of London, Amy Pilgrim has almost 20 years’ experience in public relations consultancy in Ireland, specialising in consumer healthcare and pharmaceutical PR. Amy provides insight-led solutions to clients across a full range of services including strategic counsel, thought leader engagement, content creation, congress support, product launches, social strategy, medical education, issues/crisis management, media relations, disease awareness campaigns and direct to consumer campaigns. Amy has worked with clients across the spectrum of the health and wellness industry including over-the-counter products, consumer healthcare brands, functional foods, pharmacy retail, charities, patient support groups, pharmaceutical companies, hospitals, insurance companies, industry groups and government organisations. She has also worked across a diverse range of medical specialties including cardiology, oncology, pain management, rheumatology, dermatology, gastroenterology, immunology, gynaecology, neurology, psychiatry, respiratory and urology. This broad experience gives her a well-rounded perspective on the complex nature of the healthcare industry across a number of disease areas. During her time at Wilson Hartnell, Amy has led the team to establish a client base that includes: Boots, safefood, Nature’s Valley, Edwards Lifesciences, GAA Healthy Clubs, Irish Pharmaceutical Healthcare Association, Novartis, Grünenthal, Cancer Trials Ireland, Janssen, J&J, Eurosales International and Teva. Amy has extensive experience in developing award-winning campaigns both in Ireland and internationally. Most recently this has included Best Healthcare campaign for safefood’s childhood obesity programme at the PRCA Awards and Best Pharmaceutical Marketing Award at the Irish Healthcare Awards for Pfizer. WH is a leading innovator in health and medical communications. Our clients encompass a strong mix of public and private sector organisations including pharmaceutical and healthcare companies, Government agencies, and patient groups/charities. Our team is skilled in devising strategic and creative healthcare PR programmes that play a role in supporting wider business, communications or marketing objectives. Our consultants in the health & medical practice are experienced, skilled professionals adept at working with the healthcare sector and finding new ways to interest media in health stories and topics. The health & medical practice applies classic PR techniques such as corporate PR, consumer marketing and public affairs to the healthcare sector in addition to health promotion and social marketing. Core activities provided for clients include medical marketing, medical education, media relations and strategy, issues preparedness/crisis management, scientific and lay writing, product launches (consumer healthcare, Rx, OTC), public awareness and patient advocacy. Sarah originally trained and qualified as a solicitor with Arthur Cox. She joined WH from the Federation of Irish Sport, where she was CEO for 8 years, transforming the organisation from start up to established stakeholder in Irish Sport. Sarah has a unique insight into Irish and European Sport having worked, during her time with the Federation, on all aspects of sport with Ireland’s National Sports Organisations and Local Sports Partnerships, Government Agencies, sponsors, EU Working Groups and other stakeholders in Irish Sport. Sarah’s expertise, grounded by a passion for sport and the positive impact it can have on people’s lives, includes sports marketing and communications, organisational structure and good governance, strategy, community sport, stakeholder management as well as all aspects of public and media relations. Sarah studied at Trinity College Dublin, holds a Masters of Law from the University of Cambridge as well as a Masters in Sports Management from Instituto de Empresa in Spain. She served on the Board of the National Sports Campus Development Authority and is currently on the board of Boardmatch Ireland. WH Sport, Ireland’s leading dedicated sports consultancy, is fuelled by an understanding of sport, the business of sport and the relationship between the two. Our expertise is wide, varied and continuously evolving yet grounded on a legacy that goes back more than 40 years. Our client list includes a number of Ireland’s leading sport sponsors, companies involved in sports-related CSR programmes, Irish Sports Organisations, local authorities, sports businesses, venues, facilities, teams and athletes. Our work driven always by the business need of our client covers all aspects of sponsorship from strategy and negotiation to activation, internal and external communications, media, public and stakeholder relations, content creation, digital strategy, fan engagement, event management, community sports programmes, brand building and strategic consultancy services to rights holders. We also have the benefit where required on drawing on global expertise from our sister Ogilvy and WPP companies right across the globe whose foot print and expertise in the business of sport is growing continuously. Elisabeth is a Managing Partner in Wilson Hartnell and joint head of the Consumer Practice, responsible for the development of the strategic and creative outputs for key accounts within the Consumer practice, ensuring that they meet and exceed client expectations. She has brought her expertise to a myriad of brands over the past 17 years. A graduate of Trinity College Dublin, she began her career with the largest international sporting event to take place in Ireland, the 2003 Special Olympics World Summer Games. After a few years in a boutique agency and recognising a niche in the marketplace, Elisabeth established her own PR agency in 2007 working with a range of NGOs such as the Niall Mellon Trust, the Norma Smurfit’s Irish Famine Commemoration Fund and The Rose Project, a HIV awareness charity. Following a buyout by Ocean PR in 2010, Elisabeth remained as Managing Director until 2012. Since joining WH in 2012, Elisabeth has managed a number of highly successful campaigns across a number of brands such as AIB, Failte Ireland, TK Maxx, Twitter, Etihad, Electric Ireland, ESB, Guinness, Universal Pictures and HTC. Consumer Brand Marketing and PR is the sector where the company first established its reputation and where for over four decades we have delivered outstanding creative consumer campaigns that have transformed brands. An agency of firsts, we continue to push the boundaries with innovation at the absolute core of our business. We are curious by nature, with an unrelenting determination to deliver results that future proof brands ensuring they remain present and relevant to consumers. Built on a bedrock of unrivalled expertise, we attract the best talent the market has to offer and we are constantly adding new skills and services in line with an ever-changing digital world. Our editorial mindset infuses every aspect of our work and we connect brands to culturally relevant moments, occasions and experiences every day. With laser sharp insight from our planning team, coupled with contagious creativity, our talented team of digital natives work on high profile brands in the drink, food, technology, banking, utilities, retail, leisure, fashion and travel sectors. Our diverse and unmatched client list is something we cherish. Working for the world’s leading brands means working for the best and, in partnership with our clients, we constantly challenge ourselves to keep them at the top of their respective sectors. What this ultimately means is producing innovative work that is original, compelling and most of all, effective. Whilst PR is the backbone of our skillset, we are in a constant state of evolution and increasingly, we are producing campaigns that work across the disciplines harnessing the power of technology to drive huge reach and scale for brands. From brand ideation to campaign strategy, we work with a wide spectrum of brands and businesses to achieve short and long term goals. An understanding of your values and business strategy enables us to recommend and deliver effective communications strategies and initiatives. We connect brands and businesses with their audiences, communicating newsworthy messages, stories and information on a daily basis. We create and distribute relevant content to a clearly defined audience across all channels. We plan, execute and amplify events. In 1879, a businessman called Henry Crawford Hartnell established one of Ireland’s first advertising agencies – Wilson, Hartnell & Company with offices in Dame Street. As a business innovator, Henry was ahead of his time. During the 1890s, less than 50 years after the Great Famine which decimated our country, the agency developed an innovative business model when it established an entire publication, called ‘Lady of the House’, on behalf of its client, the upmarket grocery chain Findlater & Company.A women’s magazine aimed primarily at the suburban middle classes who might just happen to have a monthly account with Findlater’s, ‘Lady of the House’ published stories, fashion columns and household tips, as well as discussing a surprising range of social and economic issues for a publication of its type. Distributed free to those who had a Findlater’s account (and costing a shilling per month to those who weren’t so fortunate! ), it also included the grocery chain’s full monthly price list in its back pages as well as regular advertisements for the agency’s other clients such as the then best-selling English household tea brand Mazawatee. While you may not have heard of this famous tea, its brand still lives on thanks to appearing on the cover of an early Elton John album and it also featured as a vintage tin on a kitchen shelf in a scene from the cult British black comedy film ‘Withnail and I’ – alongside a tin of Oxo. At its height, ‘Lady of the House’ had a paid for circulation of over 20,000 copies – very large for a publication of its type in those times. What set it apart during the decades it was published was its progressive stance on many social issues. It steered clear of party and national politics but was a leading champion of women’s education, including to third level, and frequently celebrated women who achieved educational distinction.The magazine took a similar approach to women’s entry into the professions, publishing regular valedictory profiles of ‘lady doctors’ and ‘lady lawyers’, while also proudly supporting women’s participation in sport. It also defended that classic icon of the ‘new woman’ movement of the time – the female cyclist. Fast forward to the swinging sixties and 1965 when Michael Maughan, whom many of you know, having purchased Wilson Hartnell and turned it into Ireland’s leading advertising agency, discovered that many of his clients wanted more than just an advertising service. They wanted help in promoting their companies and brands in the fast-evolving news and fledging Irish business media and so our agency was conceived. WH started off as a tiny division of the ad agency but became so successful that it was established as a standalone PR agency in 1972. Over the past 40-plus years, the agency has been involved with our clients in some of Ireland’s biggest cultural occasions and experiences and has moved confidently from its initial consumer base, into financial and corporate communications, sports marketing, healthcare, lifestyle, public affairs and digital communications. In 1985, we became part of Ogilvy, which was subsequently acquired by WPP in 1989, allowing us to apply a strong international perspective to the work we do. Reflecting the quality of its work WH has won many awards over the years including two Supreme Awards for Excellence in Public Relations at the annual Irish PR Industry Awards. In over 20 years of the awards scheme the Supreme Award has only been awarded five times. Today WH, which is in its fifth decade in business, continues to be the leading communications company in Ireland. During that time the company has been fortunate to work for many of the world’s leading brands and also for many of the public and private companies that have shaped the development of Ireland. It continues to work for such companies and brands.